However appetising the images look, simple pictures of delicious food aren’t always enough to capture people’s attention. Experiential billboards, on the other hand, that create interactive, exciting and meaningful experiences can cut through the noise and be so much more than a roadside poster. In celebration of the 10 millionth delivery in the UK and 5 millionth delivery in Australia, Deliveroo took the classic billboard one step further. 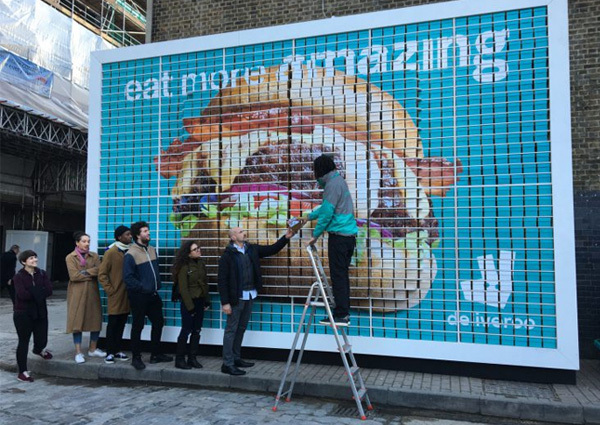 Changing the face of outdoor advertising, billboards can be much more than a static graphic; they have been work-out assistants, giant coupons, rock-climbing walls and even colouring pages, but never before has it been a display for free burgers. 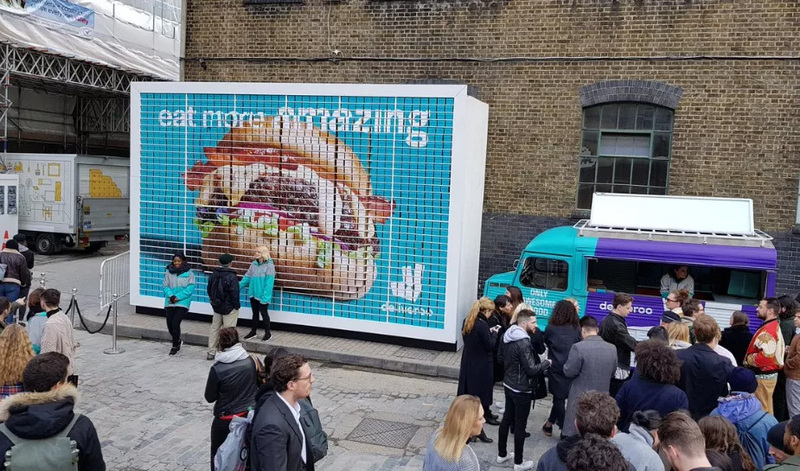 In two locations on opposite sides of the globe and for one day only, Deliveroo constructed giant live billboards from burger boxes in London and Sydney. Each burger box was printed with a tiny square which formed part of a larger picture of a pair of hands grasping a stacked and meaty burger. 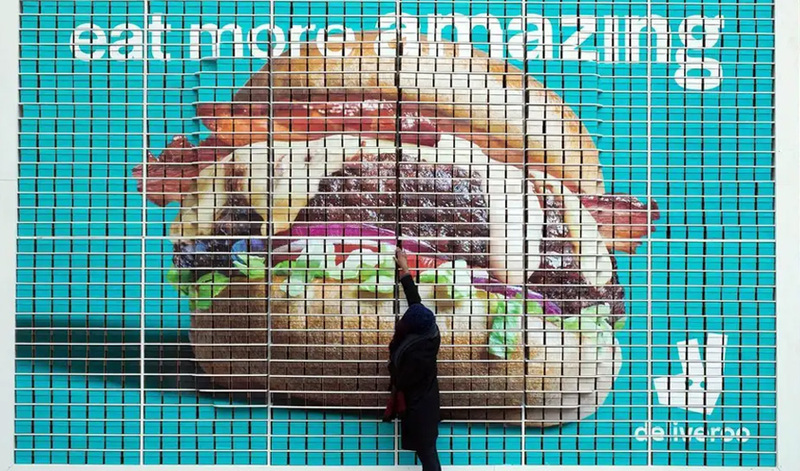 Standing four meters tall and six wide, the wall contained a whopping 2,000 free burgers which were handed out by uniformed brand ambassadors to unsuspecting passersby. Part of the Eat Amazing campaign, the burgers were supplied by favourites such as Patty and Bun, Five guys and KFC, along with a selection of each capital’s best local burger joints, and included chicken and vegetarian options too. Emily Kraftman, Deliveroo's head of marketing in the UK and Ireland, said: "As well as the big mass media we're having with TV and out-of-home, actually physically bringing that to life and having a chance to interact with people and giving them great food feels like a really important part of that strategy." Free food is a sure-fire way to build love for a brand, and Deliveroo’s interactive burger wall was a great demonstration of this. Delighted passersby took selfies against the billboard with their free meal happily grasped in hand. The billboard was a highly effective way for Deliveroo to remind people of the convenience of the service they offer; bringing customers restaurant food without the hassle of queues or the need to go out of your way. Creative and interactive billboards are far more impactful than the traditional giant poster. We have seen some outrageous and shocking billboards, but some of our favourites include The Lost Dog Home’s adorable Wait with a Mate and Snicker’s comical billboard which offered a nasty surprise.